Houdini was a Master Magician and could escape from anything, he showed the world that Magic was more than just card tricks, it could be a matter of life and death. With a little practice you will also be able to escape from your own trap. This very simple Rope trick is a great escape routine that you can perform for your friends this weekend. 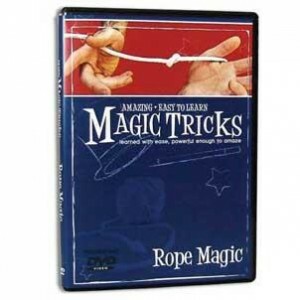 The trick is easy to perform as all it requires is a normal piece of rope and the know how of how to cross the rope correctly when you are placing it around your wrists, you get stuck a couple of times so make sure you have a friend with you when you are practicing, best of luck.